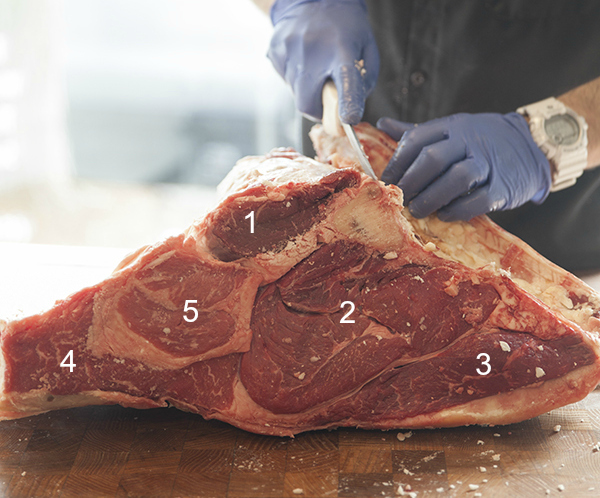 As a non-butcher, I’m sort of learning beef anatomy on my own. 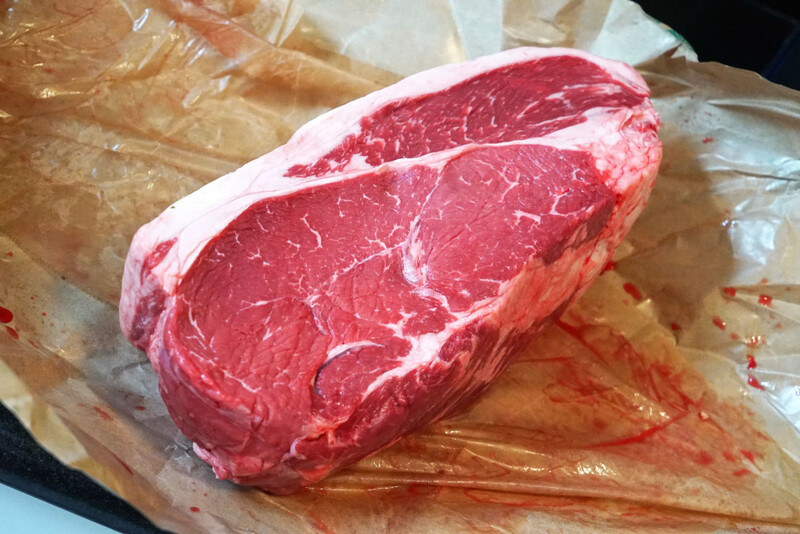 I recently purchased a 7lb hunk of top sirloin to dry-age at home in my SteakAger. 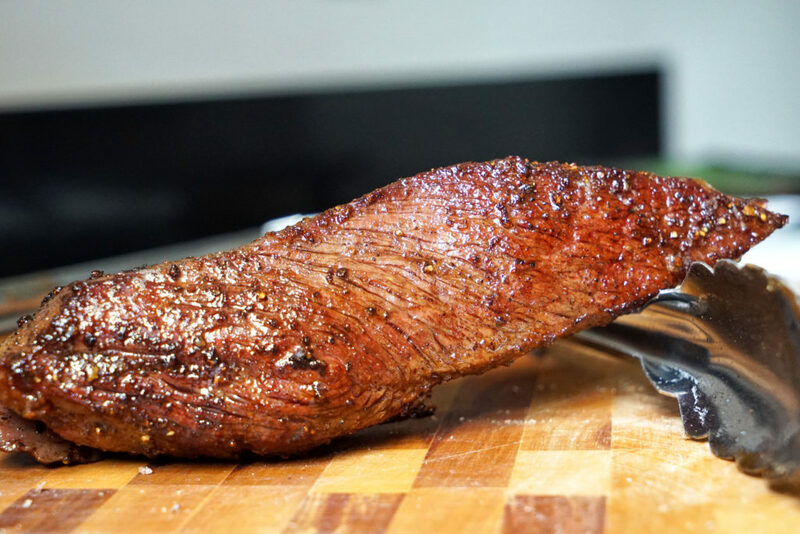 Upon close inspection, I noticed that my cut had a strange, skinny, and somewhat triangular-shaped section of meat that was clearly separated by some connective tissue. 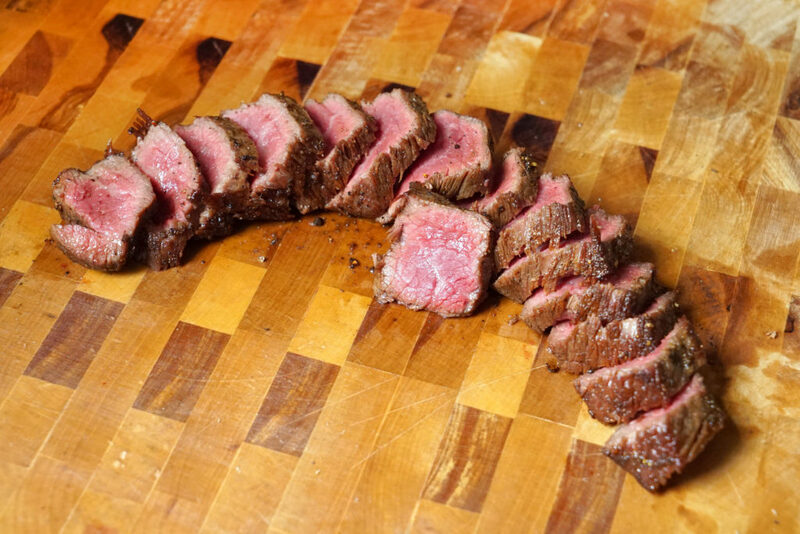 When inquiring about how to best prepare the top sirloin (either as a roast or as individual cuts of steak), I learned that this triangular piece of meat is in fact called the top sirloin cap. 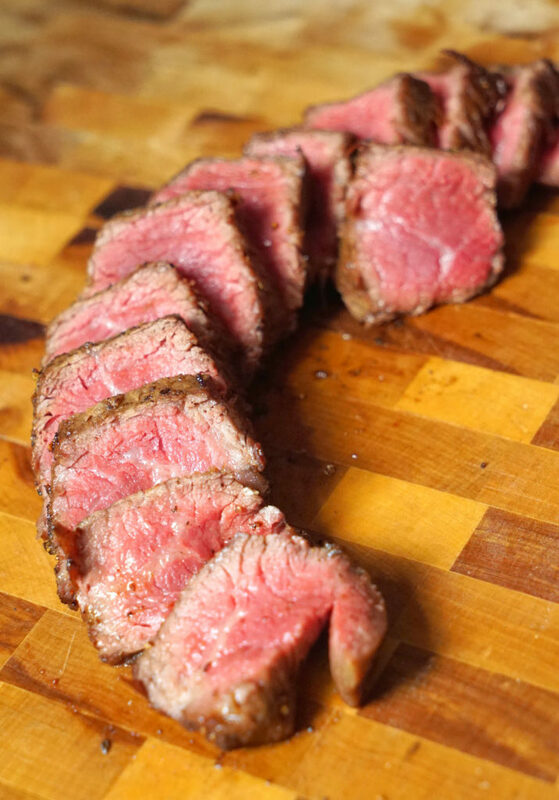 So as you may have deduced, similar to how the rib eye has a cap, known as the spinalis dorsi, so too does top sirloin have a cap; it’s just more fancily known as the Culotte. 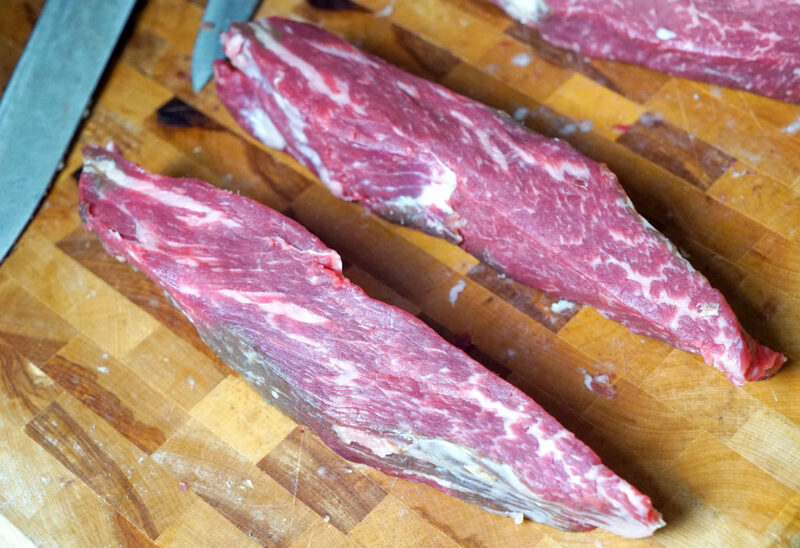 It’s much bigger and more lean than the spinalis dorsi on a rib eye, but it has similar grain structure. So back to how I discovered this: A chef I’m acquainted with, Andre Lima de Luca, suggested that I cut the top sirloin cap off and prepare that separately from the rest of the top sirloin, so that’s exactly what I did after confirming that what I thought he was talking about was indeed the triangle of beef that I noticed at the outset. 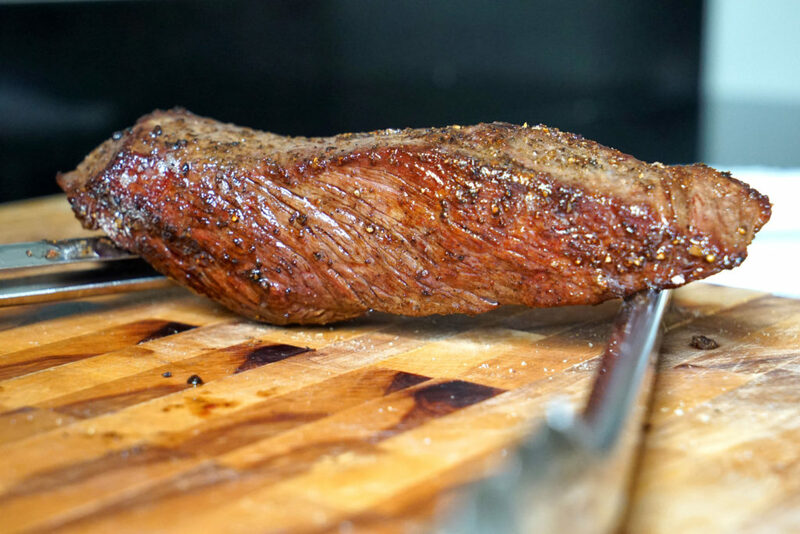 With the fat ridge still connected, this cut is essentially the same as picanha. 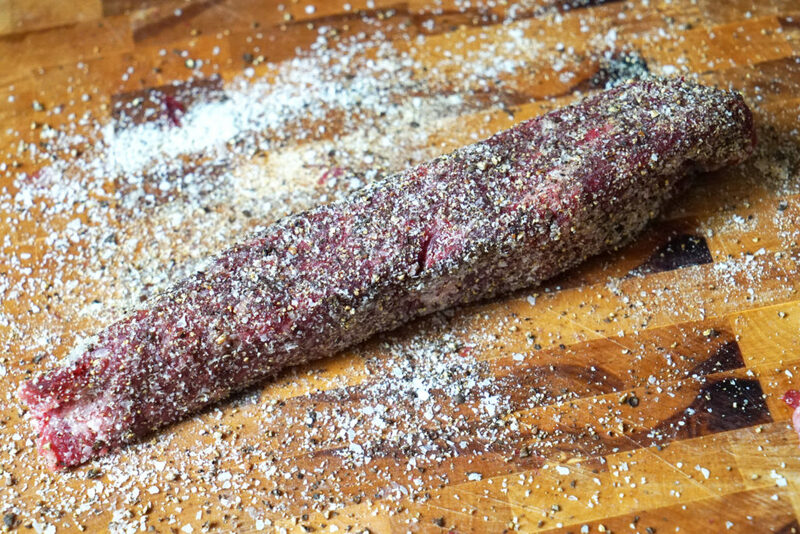 Below is a shot of my cap/Culotte, after being dry-aged for over a month and trimmed of any bark. Since my 7lb hunk was already cut down significantly from it’s original size, I wasn’t left with too much. 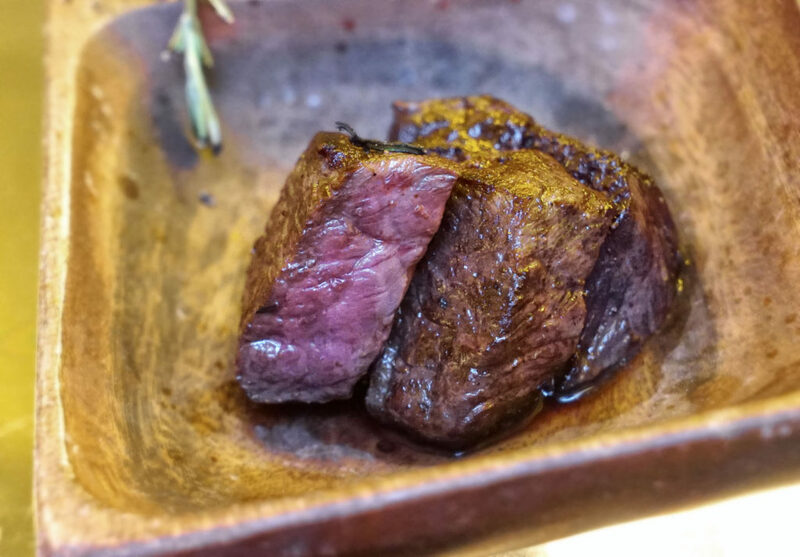 My first encounter with Culotte on a menu at a restaurant was at Bohemian, a secretive, dine-by-referral-only restaurant that’s nestled in the back of a high-end Japanese butcher shop called Japan Premium Beef. The cut there is washu, another name for the wagyu cattle from Japan, so it is considerably more tender than most normal cuts of this stuff. 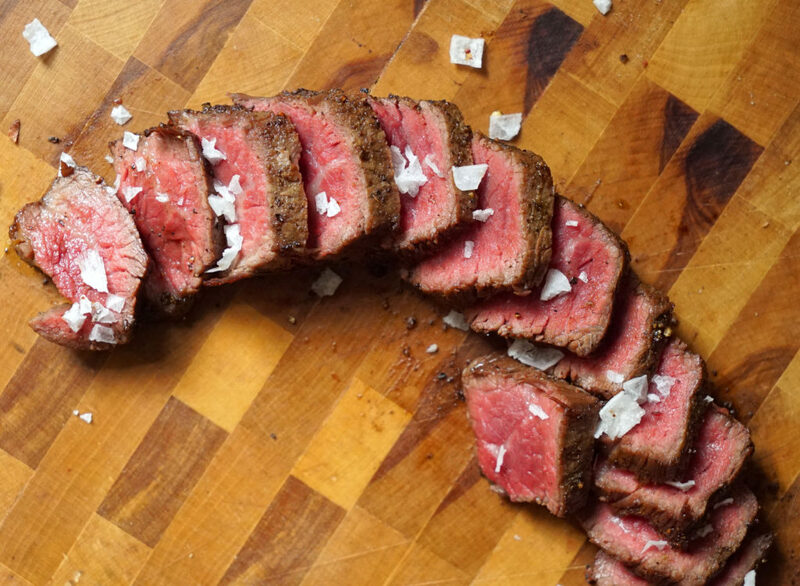 The flavor and texture is similar to strip loin, but a bit less grainy and more buttery. 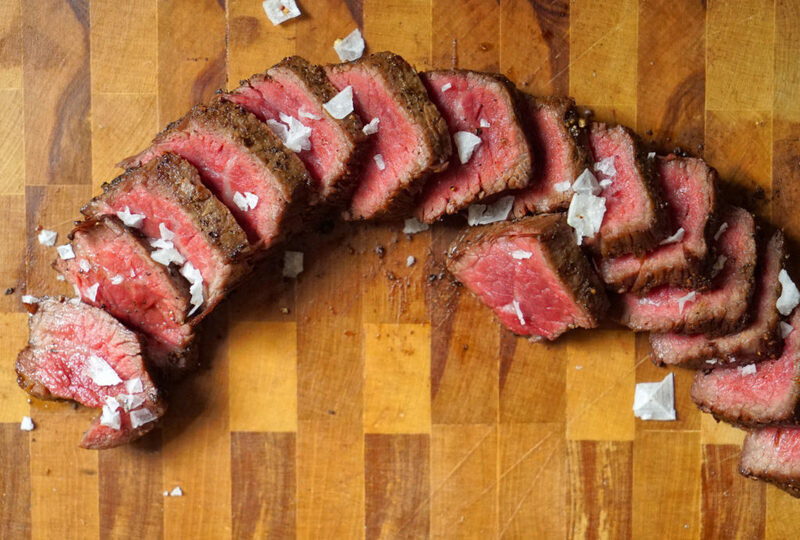 I recommend cutting this into small pieces when you actually eat it, smaller than you would for, say, a filet mignon. The larger the piece, the more chewing you will have to do. More chewing means it will feel tougher, and that’s not good. 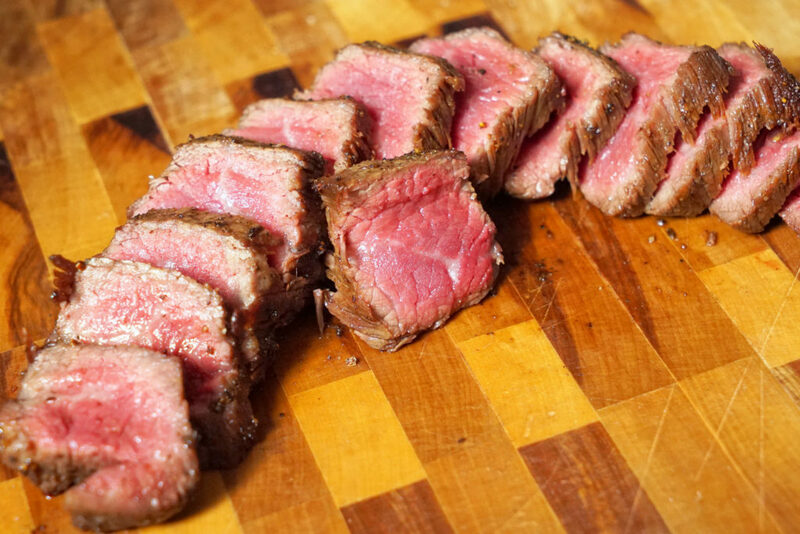 These cuts can be very simply prepared: sear in a pan with butter, salt, pepper and herbs. 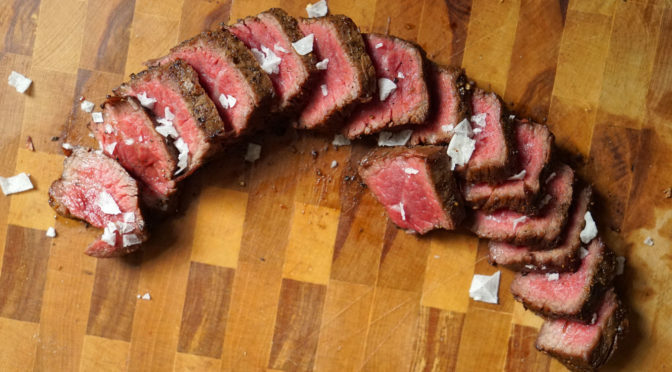 Cook to medium rare to preserve tenderness, as the meat grain will tighten up the more you cook it, making the beef tough. 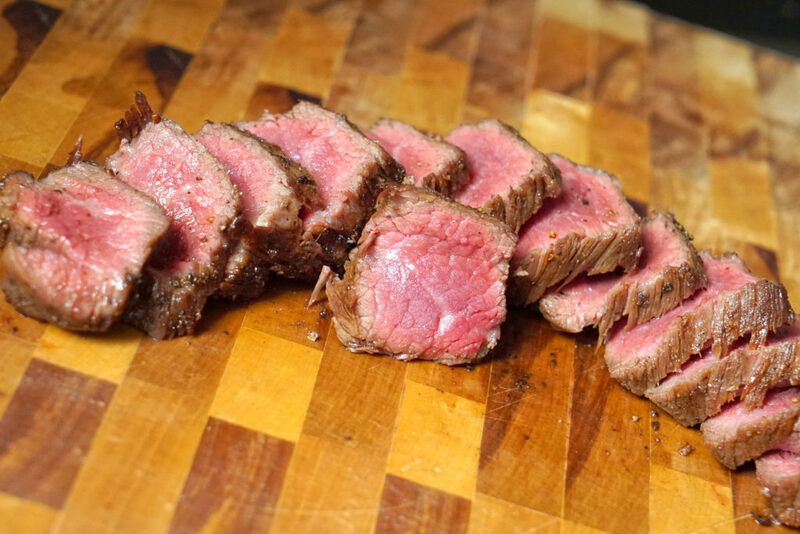 Also cut cross-grain to maximize tenderness. You can see the grain here in this cut. 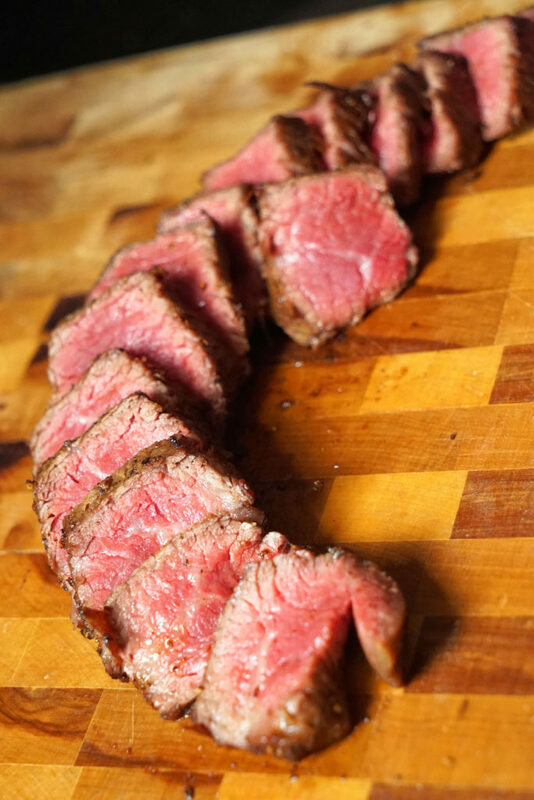 When slicing for plating, you want to cut diagonal from top right to bottom left, against the grain. 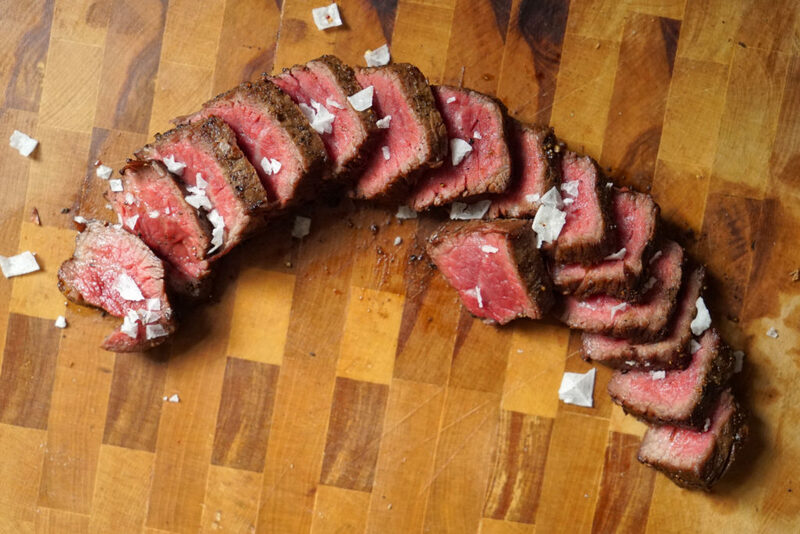 Finishing salt flakes really make the flavors pop.